As the year draws to a close, we’d like to thank all of our supporters for your loyalty and generosity this past year. Whatever your tradition, we wish you a happy, healthy holiday season. We’ve been busy all year at the Great Bear Foundation, with bear ecology field courses, teaching thousands of children about bear conservation through our Bear Basics program, and sponsoring wildlife track-making events. We’ve also been working directly with agencies and community members to address bear attractants, and weighing in on policy issues that affect bears and their habitats. We are going to press with our next issue of Bear News, which you’ll find in your mailbox soon. It’s been a tough year for bears. Wild foods have been sparse in many habitats this year, and bears woke up hungry and returned to their dens hungry. Thankfully, there is good news too. The Northern Continental Divide grizzly bear population has been growing as a result of better wildlife policies, enforcement, and education projects by the Great Bear Foundation and our partners. 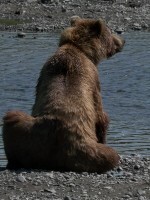 However, human development continues to threaten grizzly habitat. More people living, working, and playing in bear habitat means more potential for conflict. With the growing human population, we are focusing on public education, reducing bear attractants, and conserving and connecting habitats so that grizzly bears are not reduced to island populations. Grizzlies are reclaiming historic habitat, moving back onto the prairies east of the Rocky Mountain Front. This is an exciting time, as we witness the success of more than 30 years of hard work, and watch the bears return to the landscape. As a supporter of bear conservation, you can take pride in being a part of this success. Despite these gains, bears are hurting worldwide. Grizzlies are killed in record numbers by elk hunters, cars and trains, and when residents catch them raiding unsecured chicken coops, garbage, and fruit trees. Bears around the world are losing habitat at an alarming pace and falling prey to the black market for use in Traditional Chinese Medicine, as exotic pets, and cheap entertainment. But one of the most heartbreaking problems is the loss of sea ice, the largest of many threats to the polar bear. How can you help? Start by supporting the Great Bear Foundation. For over 30 years, we have provided free educational programs to schools and communities, helped people manage their bear attractants, fought for ethics and accuracy in wildlife media, kept people informed on current threats to bears and their habitats, and served as a watchdog for issues like the bear parts trade and the growing, unregulated wildlife tourism industry. We need your help, and we need it now. We are a volunteer-driven, member-supported organization, and we use our resourcefulness to keep overhead low, so your money goes directly to bear conservation projects. These are tough times for everybody, but we are feeling the pinch as we take on more responsibilities to fill gaps once met by government services, while grants and donations get smaller and less frequent. You might be surprised to learn just how far your membership contribution goes. Want to stretch out your contribution to support bear conservation throughout the year? Now you can schedule recurring donations securely through JustGive. Please think of us for your year-end giving, and, more importantly, think of the bears.